My Runsketeer buddy TPP has been focusing on cutting back on her sugar and carbs. Reducing your sugar intake is a good idea (provided there are no underlying issues related to hypoglycemia). Moderating simple carbs is always smart. Most of the time we don't need that sugar, but our cave-person genetics force us to crave it. The one exception is when you are 40 minutes into a 10K and you need energy right now. I used to use GU gels frequently on my runs, even when I ran relatively short distances. Now I rarely use energy boosters, or anything like it. I've now reached the point in my half marathon training program where I'm approaching double digit base runs. That means I'm running for 80 minutes or more at a time, long enough to (supposedly) deplete my glycogen stores. So far I've avoided using supplements during this training. I took a GU gel along on Sunday, but never felt like I needed it. Then again, despite all the hills, I really didn't push myself that hard. 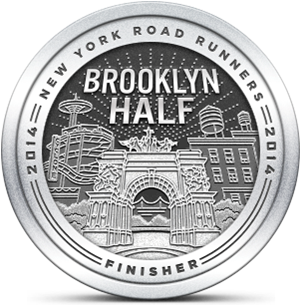 I'm not Brooklyn race ready yet, but I've definitely moved the needle in terms of endurance. Running seven easy miles, as I did over the weekend, would have been a struggle four weeks ago. But I felt great on Sunday. This morning I ran another set of 6 x 400 repeats, this time on the treadmill. I prefer to do this workout on the track or at least on pavement, but it was raining fairly hard outside this morning. Considering the challenge I had running 220's a couple of weeks ago on the treadmill (at a slightly slower pace), I can see progress. Today's quarters were run at 7.2 MPH, book-ended with half mile warm up and and cool down runs. 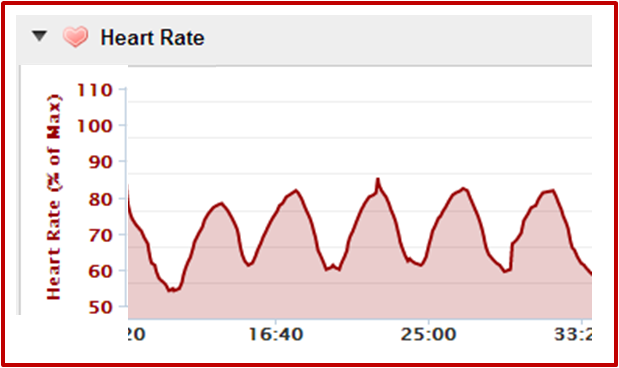 I was very pleased to see my HR reaching 85% of max by the final seconds of each interval. I plan to take the speed up to 7.3 MPH next time I do treadmill repeats. Tomorrow is my mid-week base run, which by my formula (80% of Sunday's long run) should total 5.6 miles. I'll try to run at least two of those miles at Half Marathon target pace, per the advice of SIOR. This will be the first "bridge" workout where I partially combine a speed and distance run. I'll be interested to see if I've restored my fitness well enough by now to manage through it. Um... I think you should run easy tomorrow and do the HM pace run Thursday or next Tuesday. Otherwise, it looks like the schedule and consistency are paying off. It's nice when you notice the difference in effort. Nice going! Are you guys doing the GLIRC group run this weekend? Run easy tomorrow - you bet! I'll do Thursday's run as a tempo with a couple of miles at HM race pace. I'm glad you wrote that because I looked at the HM plan and saw that I was supposed to do 7 x 400's this week, not 6. My response would have been, "I'll go eat a giant cupcake, plus they also have a run." Have you learned NOTHING from TPP's rejection of carbs and sugar? You're doing SO well, ER! Kudos on sticking to plan and making it work! I bet you're thrilled! I did not know about the GLIRC run this weekend. Who's going? I don't know at this point if I can keep up because of my endurance level flagging. Thanks TPP. Don't sell yourself short, you did big mileage on those hills on Sunday. I'm planning to run in a very similar way on Sunday and I don't care if I'm in the back of the Club Run pack when I get my 8. Let me know if you decide to do it. Repeats are about the only thing I can get myself to do on a treadmill. I don't know how people do long runs on them.